In April’s Channels e-newsletter (Volume 2), I reviewed the importance of and techniques for ensuring proper engine alignment. That is, the alignment between the engine and the propeller shaft. Nearly all marine engines are designed to be adjustable, to a point, relative to the propeller shaft, using adjustment or jacking nuts on their motor mounts. The adjustment should be thought of as no more than fine tuning, the maximum range of vertical travel being limited to no more than an inch or two at the most. Thus, the responsibility rests with the naval architect and boatbuilder to ensure that the design and execution of the engine installation guarantees near perfect alignment with the shaft. 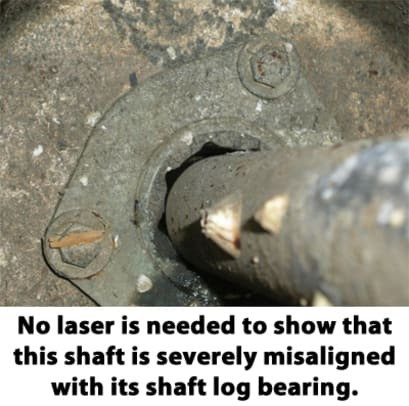 There is another side to the alignment story; it involves the support and position of the propeller shaft relative to its bearing(s), the shaft log and the engine. 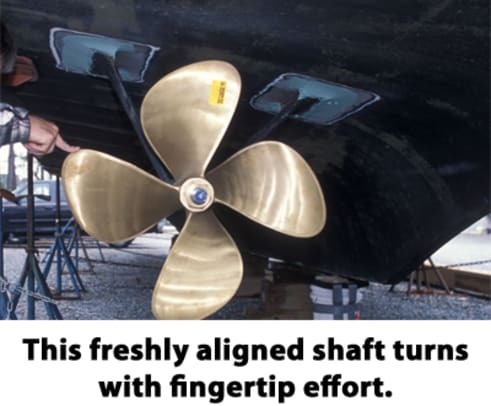 While engine alignment is well understood by most marine industry professionals, shaft alignment is far more esoteric and well understood by far fewer folks in the industry. In my experience, precious few truly understand its importance, and fewer still understand the techniques and processes involved in making adjustments and corrections. A few years ago I inspected a vessel while it was hauled out. When I came to the propeller I made an unsuccessful attempt to rotate it, to gauge the condition of the bearings and alignment. Regardless of how hard I tried, I was unable to rotate either shaft on this twin-screw vessel. This is a clear indication of either severe shaft misalignment (as opposed to engine misalignment, which rarely imparts this sort of resistance) or, less commonly, swollen cutless bearings. While final alignment of an engine to its shaft should only be carried out while a vessel has been afloat for at least a day, even when hauled out the shaft should turn without undue effort once adhesion between it and its cutless bearings is broken. In this case, even when hanging on a propeller blade I was unable to budge these shafts. Clearly, this vessel was in need of a shaft and bearing alignment analysis. In virtually all cases, propeller shafts are supported by one and sometimes as many as four, for longer shafts, cutless bearings. Cutless bearings are tubular pipe-like components, the outer shell of which is typically made of brass, and sometimes a fiberglass-like material (the latter is designed to be used on steel and aluminum vessels, to avoid the corrosion potential caused by copper alloys like brass), with an inner liner of grooved or fluted rubber. It comes as a surprise to many users that the sole source of lubrication and cooling is seawater; if water flow to the bearing is insufficient or if it’s interrupted by marine growth on the shaft or clogging of a shaft log water injection system, rapid bearing wear can ensue. Cutless bearings may be found in and supported by struts, I- or V-shaped metal supports attached to the vessel’s hull, through which the shaft passes, and/or embedded within the shaft log, in the keel or hull. When the vessel is built, the builder must make a concerted effort to ensure that bearings are properly located to support the shaft, while ensuring that they are also aligned with the theoretical shaft’s centerline, a line that is perpendicular with, and begins at the center of, the transmission output coupling, and travels aft through the cutless bearing(s). The line must also be centered in and parallel with the bearing(s). If the builder is successful in ensuring this alignment, barring groundings or other damage, it should remain correct throughout the life of the vessel. While small adjustments may be made to the relationship between the engine and shaft, by adjusting the location of former, the shaft’s relationship to and alignment with the bearings should remain constant. In practice, it’s not uncommon to encounter shafts and bearings that are misaligned, and the greater the number of bearings, the greater the likelihood of misalignment. While shaft to bearing alignment can be challenging, aligning a shaft to several bearings, as well as the general location of the engine, can be daunting indeed. As such, it’s easy to see how this process can go awry while the vessel is being built. Traditionally, during construction or repairs, the process begins with a length of small diameter yet stout string, which is glued to the center of the transmission output coupling. It is lead aft, through the hole through which the shaft would pass, the shaft log, and out and under the vessel’s stern section, where it is anchored to a weight. Using this string as a reference point, bearings and, if present, struts are positioned. When properly aligned, the bearing(s) must remain centered on and parallel with the string. While this traditional approach is still used, more modern tools are now routinely employed; these include lasers and optical sights. Using a laser or sighting tool, an installer can, with a great deal of accuracy, position one or more bearings along the sight line. While this aspect of shaft alignment is critical, it’s the easy part. Setting the bearings in place, permanently, can be more challenging. Initially, the strut or bearing is “dry fit.” That is, it’s positioned roughly to determine what needs to be done to align it with the shaft. The process typically involves a technique known as casting. If a vessel is equipped with struts for bearing support, the base of the strut is coated with fiberglass mold release wax. It is then set into a mixture of thickened, reinforced epoxy and positioned so that it remains centered on and parallel with the string, laser or optical sight or shaft line. 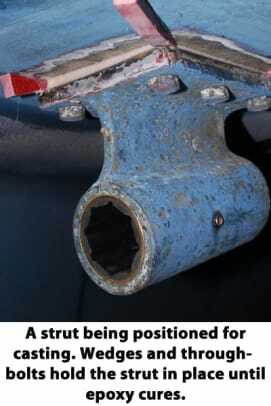 The strut is “hung” from support fasteners and wedges are used to adjust its height and orientation to the shaft centerline. Once the position is set, the epoxy is allowed to cure, after which, thanks to the mold release wax, the strut is removed. Wax is removed from the strut and the epoxy surface, and the strut is then set in polyurethane bedding compound, ensuring a watertight seal with the hull. In some cases, the bearing centerline may be below that of the shaft. In this instance, depending on the degree of misalignment involved, a recess may have to be made in the hull, to accept the strut’s base, the strut may require modification or a new strut may need to be manufactured all together. A similar process is employed for cutless bearings that reside within the shaft log, sand strut. The bearing itself is waxed and set in epoxy; wedges are used to position it so that it remains parallel with and centered on the shaft line until the epoxy cures. Ultimately, most if not all cutless bearings are retained using set screws and thread locking compound. Ultimately, once the shaft to bearing alignment is complete, even a large-diameter, long shaft should, with the benefit of nothing more than light lubrication from soapy water, rotate with little more effort than is required to lift a bag full of trash from a galley waste bin. Before entrusting your vessel to anyone for shaft alignment analysis or adjustment, carefully scrutinize their knowledge and experience on this all too important yet frequently misunderstood subject, and ask for references as well.